We’re sorry to hear your Sub-Zero Ice Maker is no longer making ice. Summer’s upon us and that means hot days, so let’s get your ice maker back on its feet so you can have the tall, icy glass of water for which you’re thirsting. Check the water filter. If it’s been a while since you changed the filter, the mesh may have become clogged with mineral deposits, blocking water flow through the unit. Your Use & Care manual will have instructions on how to change the filter and you can purchase replacement Sub-Zero water filters here. For best results, Sub-Zero recommends changing the water filter every 6-12 months, depending on usage. Do make sure you’re buying certified Sub-Zero water filters—there are many counterfeit refrigerator water filters online, and not only do they perform less well, some are even made of toxic materials. You can read more about counterfeit water filters here. Check that the ice bucket is correctly placed. If you’ve removed the ice bucket, be sure it was replaced correctly. The ice maker only switches on when there is contact between the bucket and the electronic switches at the back of the fridge. Check that the ice level arm is in the down position. The arm is white, wide and flat and is situated above the ice bucket when the freezer is closed (note: freezer trays are removable for easier access). If it’s up, shut off the freezer (refer to your Use and Care guide to learn how) and gently push the arm down. If it won’t budge, don’t force it, as you may break it. Once down, restart the unit. If the arm has become disconnected, it may have to be reinstalled or replaced if broken (in which case, call us, we sell replacement parts and can also handle the repair for you). Check whether the fill tube is frozen. If the arm is down, next check the fill tube. The fill tube is a thin tube located above the ice maker, coming from either the back or side wall. Low water pressure can allow the water in the fill tube to freeze, preventing flow to the ice maker. If it feels especially stiff, turn off the unit and use a hair dryer on low speed to melt the obstruction. When using a hair dryer, be sure to move the dryer back and forth to avoid melting the plastic piping. Check that ice isn’t obstructing the exit from ice maker. 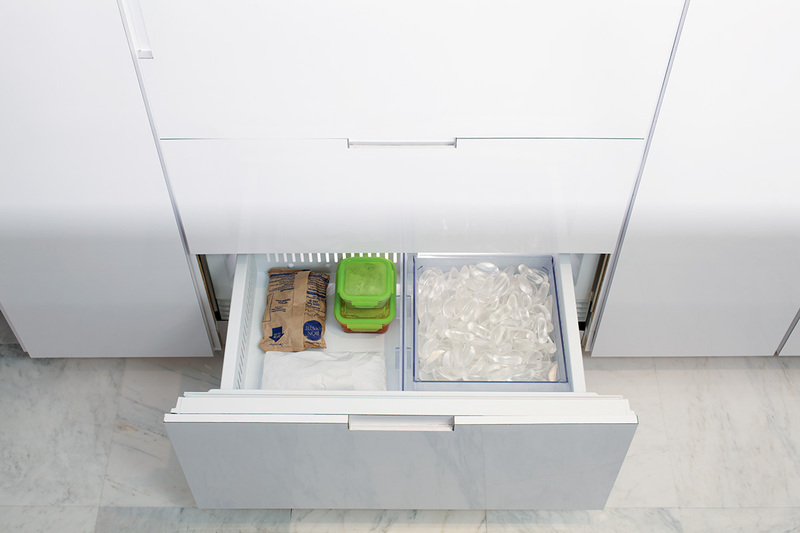 Sometimes ice cubes will stick together if the freezer door has been opened repeatedly in a warm kitchen, obstructing the ice’s exit from the ice maker. Grab that hair dryer again, and set it on low, and pass the warm air over the clumped ice until the pieces separate easily. After freeing obstructions, turn the unit off and then on again to reset. If none of those ideas puts the ice in your ice water, give your Sub-Zero premier partners at Box Appliance a call at 888.782.9653 or schedule online – for all Southern and Northern California locations. Our friendly, knowledgeable customer service team will be happy to help you solve the problem and set up a service call at a time that works for you.